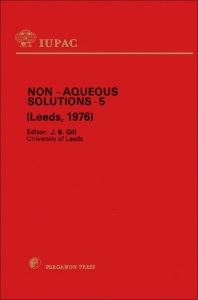 Non-Aqueous Solutions — 5 is a collection of lectures presented at the Fifth International Conference on Non-Aqueous Solutions held in Leeds, England, on July 5-9, 1976. The papers explore reactions in non-aqueous solutions as well as the thermodynamic and kinetic properties of non-aqueous solutions. Examples of the use of spectroscopic techniques are presented, and solutions in molten salts are given. Metals in solution and liquid metal solutions are also considered. This book is comprised of 12 chapters and begins with a review of a general scheme which considers the species formed by cation-electron and electron-electron interactions at dilute to moderate concentrations, along with the influence of the solvent and the metal on these interactions. The discussion then shifts to the application of electron spin resonance spectroscopy to the study of solvation; the influence of solvent properties on ligand substitution mechanisms of labile complexes; and the effect of acidity on chemical reactions in molten salts. Subsequent chapters deal with the chemistry of solutions of salts in liquid alkali metals; preferential solvation in kinetics; and the use of non-aqueous solvents for preparation and reactions of nitrogen halogen compounds. Results of Raman spectroscopic studies of non-aqueous solutions and spectroscopic studies of coordination compounds formed in molten salts are also presented. This monograph will be of interest to chemists.